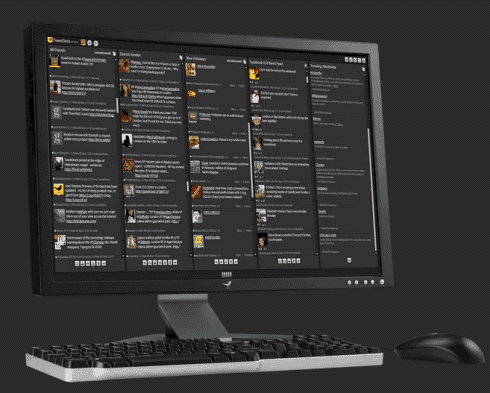 So, after all the rumours and speculation Twitter has bought Tweetdeck for a whopping $40m. Big mistake chaps. If you didn’t already know it, Tweetdeck is an application for managing social network information, in particular Twitter. On its own, Twitter is pretty much useless. The front page is of no use at all and even if you are logged in all you see is a mish-mash of stuff; no order to it, no categorisation, just Tweets from the people you follow. Is it any wonder that people need something to manage Twitter? Thankfully, various “Twitter Clients” exist – such as Tweetdeck, Seesmic or HootSuite – which make the manipulation and management of Twitter easier and more user-friendly. Tweetdeck was one of the first, is a British invention and has millions of worldwide fans. Clearly, Twitter realised that their product was not up to much and needed a better interface – so they went on the hunt for software that would do it. Enter the deal with Tweetdeck. With Tweetdeck you can organise your Tweets very well indeed and you can manage your followers and be efficient with your use of Twitter. But with HootSuite you can do all of this and run it from a corporate account allowing multiple users to Tweet from one account, or allow multiple accounts to be Tweeted by one individual. You can also more easily schedule Tweets – months in advance. On top of that, HootSuite integrates with your blog, allowing you to connect it directly to Twitter – and you can do this with all your social media accounts in one place. Plus you get excellent analytics with HootSuite, letting you know the precise value of every single Tweet. In short, HootSuite has so much more to it. With Tweetdeck you either need to run it as a separate piece of software on your PC (using Adobe Air), or you need an App for a mobile device. At the moment, the only web browser you can get Tweetdeck on is Chrome – others are to follow (currently in beta). With HootSuite you can run it on any web browser you like, which means you can access it anywhere, any time – not the case for Tweetdeck. Tweetdeck has many fans – Twitter amongst them it seems – but when you stack up the capabilities of HootSuite against Tweetdeck, one appears to be a full-functioned, user-friendly, easy-to-use application and the other appears to be limited in functionality, difficult to engage with and not user-friendly because you can’t use if it you want to do so via Firefox, say. Having bought Tweetdeck you can bet that Twitter will want more of us to use it; and therein lies the problem – its limitations will now be exposed amongst a much wider audience (most people who Tweet do not currently use Tweetdeck). And once those limitations are exposed Twitter could well be in the very place they were in yesterday before they bought Twitter – with a less than friendly interface. And that’s not where they need to be. They need to be banging on the door of HootSuite pretty sharpish I reckon. Maybe it was the cheapest option. So they spend a few more $, re-develop it and use their market reach to make it the defacto standard. Takes out the other vendors, gives Twitter what they want, gives users what they want. Acquisitions often kill the acquired technology, especially where it is a cross border acquisition, so don't assume it is about the product as it now is, but what is will be as part of Twitter. Like shooting clays or game, you have to aim ahead ahead of the target. Hi Colin, Thanks for the comment – I think you make a very good point. Maybe the acquisition is more about what Twitter plans for the future, rather than what it can do with Tweetdeck now. But if they wanted to kill it off, I think they could have done that more cheaply than spending $40m…they could simply have switched off API access for Tweetdeck. Reading between the lines I have always thought that Twitter favours HootSuite themselves. Perhaps it is all about giving a clear path ahead for them…?